You may easily notice - Now in these the users are being addicted to do all the work very shortly and immediately. They even don't want to waste their few minutes here and there. And so, the entire manufacturers are trying to produce their products which can save the user's money, energy and time. but most important is time saving. Here a nice example’s available for you. Apple provided various apps and features by which user can easily & directly operates their various Mail account, social website connection, important data transfer, PC's downloading torrent and many more things. Here a interesting and very useful feature of Apple has explained and that is: How to Print Photos Directly from your iPhone and iPad. Users have a nice way to Print Photos Directly from their iPhone and iPad, and that valuable way is not other than Apple's AirPrint. By the help of AirPrint you can print photos, documents, Webpages or other things directly from your iPhone or iPad without any wires connection or transfer files process. All those users who still don’t know how to do this easy work with AirPrint, they should take advantage of this feature instead of transferring files from their iPhone/iPad devices to the computer simply to print them. I am going to describe the step wise process about - How to Print Photos Directly from your iPhone and iPad. And by following these steps you can easily print your photos directly on any AirPrint-capable printer. (c) Firmly fixed Wi-fi connection. Step (1): Firstly, you have to make sure that the Wi-fi connection of your iPhone/iPad and the AirPrint capable printer are in same Wi-fi network. Here same Wi-fi network is required because the AirPrint works on the fundamental source of discovery (For the connectivity iPhone/iPad searches an AirPrint device and then connects). so, here you need to connect your iPhone/iPad to the Wi-fi network and also the Wi-fi of your printer too. Step (2): Now, go to the folder of your photo album in iPhone/iPad device and select a photo to print. And if you want to print several photos at once, then you will have to tap on the Edit button which is located on top-right and just select the photos which you wish to print. There is no any limitation of how many photos you are printing, you may print according to you wish. Step (3): when you want to print one photo, and then just tap on it and after that tap on the share icon bottom. And when you want to print several photos at once, and then simply tap on share after selecting the photos which you wish to print. Step (4): Now it’s time to tap on print, and after this tapping you will get the print screen. The printer which you are using for printing is AirPrint capable and you have connected with Wi-fi network then it will auto-detected and shown. 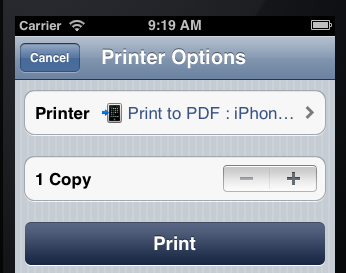 Finally now, you have to select the number of copies (How much copies you want to print) and hit on the "Print" option. Congratulation, you have done. i assure you - it will save your time instead of make a connection with wire or File transfer on computer. Many user are using this shortcut option, now its your turn to use. Feel free to share your valuable comments with us.